The US Air Force has sacked nine mid-level nuclear commanders and will discipline dozens more in a test cheating scandal, officials have said. Nearly one in five of the Air Force's nuclear missile officers have been implicated in a ring of cheating on monthly proficiency tests. Air Force Secretary Deborah Lee James has said the nuclear force is suffering from "systemic problems". A series of programmes to improve leadership are also said to be planned. None of the fired commanders is directly involved in the alleged cheating. Each was instead determined to have failed in leadership responsibility. May 2013 - The US Air Force temporarily strips 17 officers at Minot base in North Dakota of their nuclear watch authority following a poor grade in a missile launch test. In addition to the nine officers sacked, the senior commander of Malmstrom Air Force Base's 341st Missile Wing, Col Robert Stanley, was allowed to resign. Commanders of the 341st Wing's three missile squadrons - each of whom is responsible for three nuclear missiles - were also fired, the Associated Press news agency reports. Ninety-one missile launch crew members at Malmstrom have thus far been implicated in the cheating scandal, including more than 40 who face disciplinary action that may include dismissal. Cheating allegations first emerged during investigations into alleged drug use by personnel at other bases. In the wake of the revelations, the Air Force announced the entire team at the base would be re-tested. 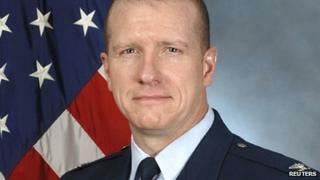 It is the latest scandal to hit the US Air Force and nuclear missile force. Defence Secretary Chuck Hagel had previously ordered a high-level review of the US nuclear forces, saying he was "deeply concerned" about morale and discipline among nuclear officers, while insisting that US nuclear arms were safe.